Shades of grey: Malcolm in the Middle 01 features grey tinted lenses, available with or without polarization. The frame is matte black metal and the temples are matte black acetate. The black ceramic nose pads are hypoallergenic. The “middle” accent is a gorgeous grey marble acetate, and silver sea glass side inlays complete the monochrome look. Stuck in the middle: Malcolm is a sleek, squared-off interpretation of the traditional aviator shape constructed using only the finest materials and best craftsmanship. Each frame is meticulously handmade in Japan and features high-quality shatterproof lenses with 100% UV protection. 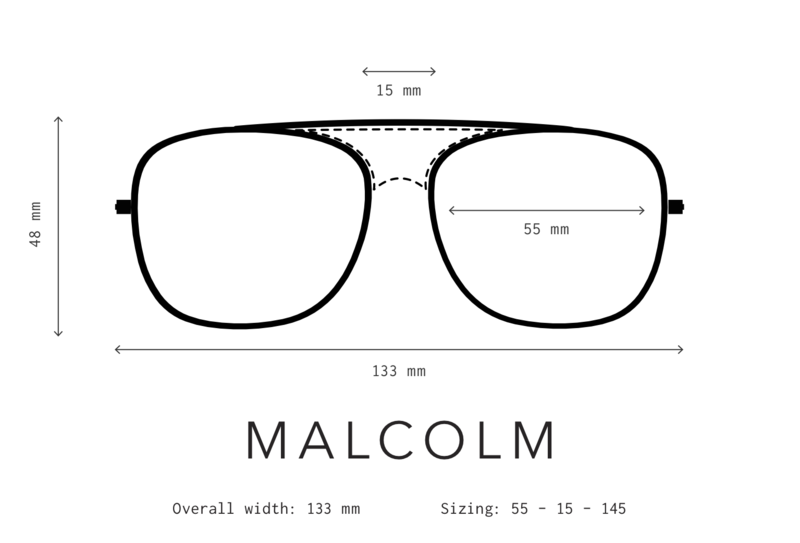 The Malcolm shape was designed to be comfortable and flattering on all face shapes. Its super-durable surgical stainless-steel construction and smooth, high-quality hinges ensure these will be your favorite shades for years to come. Malcolm in the Middle styles feature a bold acetate insert in the middle of the lenses.